This project exemplifies my broad imagination. 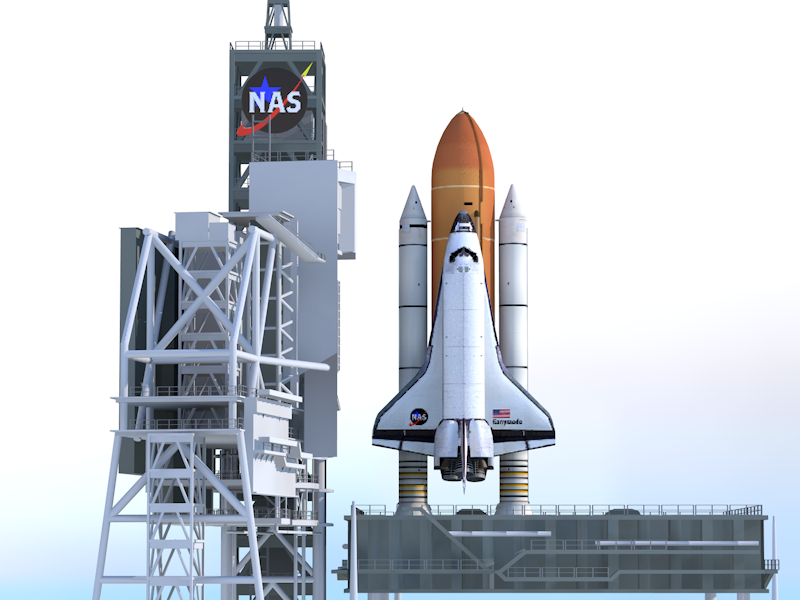 In light of the Shuttle program’s 2005 return to flight, I established the fictitious National Aerospace System or NAS (pronounced N.A.S.). This was originally going to be a routine set of launches for a two-foot-tall model rocket I had been designing since then. 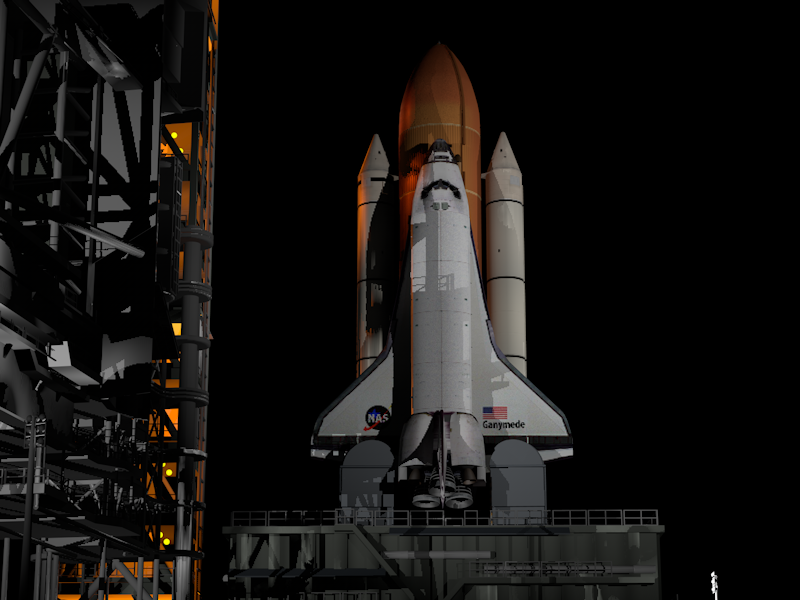 But upon learning how to use 3D modeling software, I conquered what I thought was impossible for me back then–using a computer program to animate my own controlled Space Shuttle launches. See, launching a model rocket has way too many downsides. For one, it’s best to launch with a club and if I launched with a club, I wouldn’t have had the freedom that I wanted because not only were these going to be hobby launches, they were to be film and production projects as well. Launch space is limited where I live and the dangers outweigh the benefits. There are a lot of physics, calculations and predictions in the sport of rocketry, and launching a delicate two-foot tall model for a rather slow liftoff and a low altitude would have ultimately been nothing short of a disaster. As a result, the project was shelved for good in 2010. The original build from 2005. 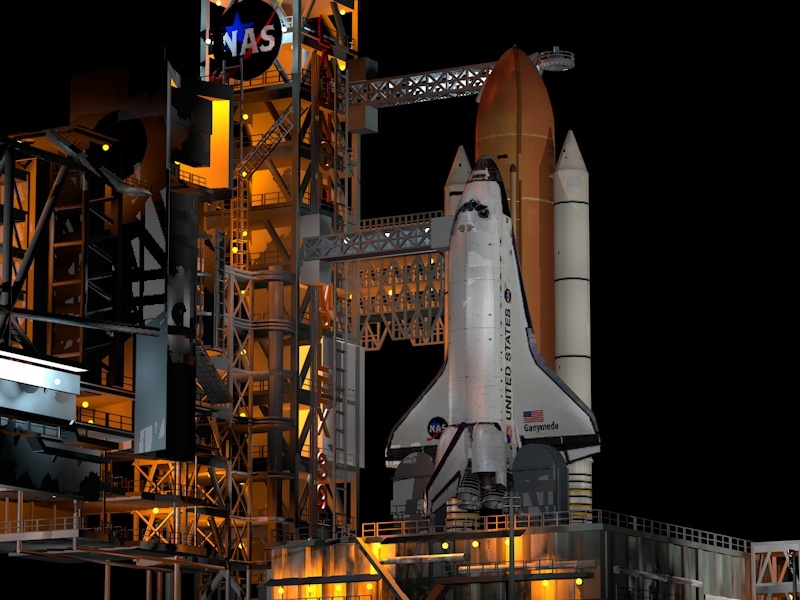 In October of 2012, I came across free models of spacecraft and launch pads on the NASA website and from there, the rest was history. 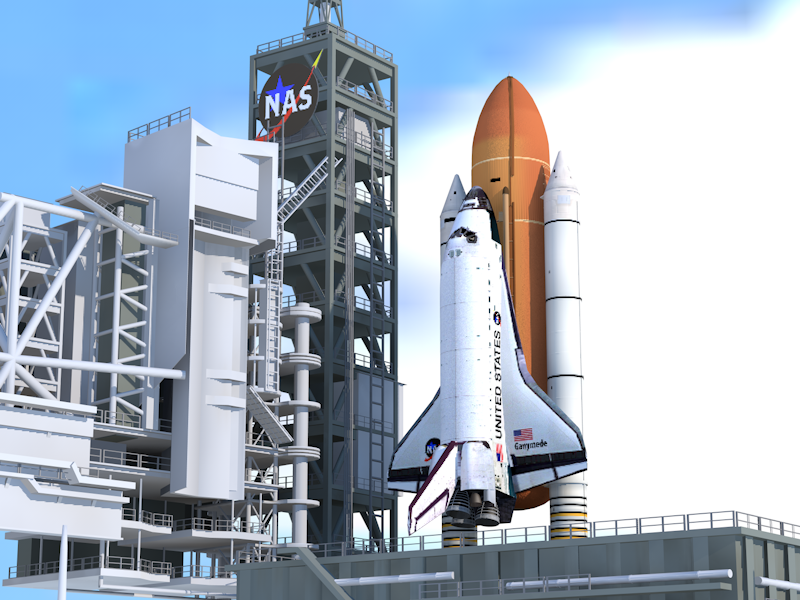 Using elements and ideas from the two launch pads and designs I created above, I took the NASA models and their textures and made them into works of my own, thanks to Adobe Photoshop and Maxon Cinema 4D (C4D). 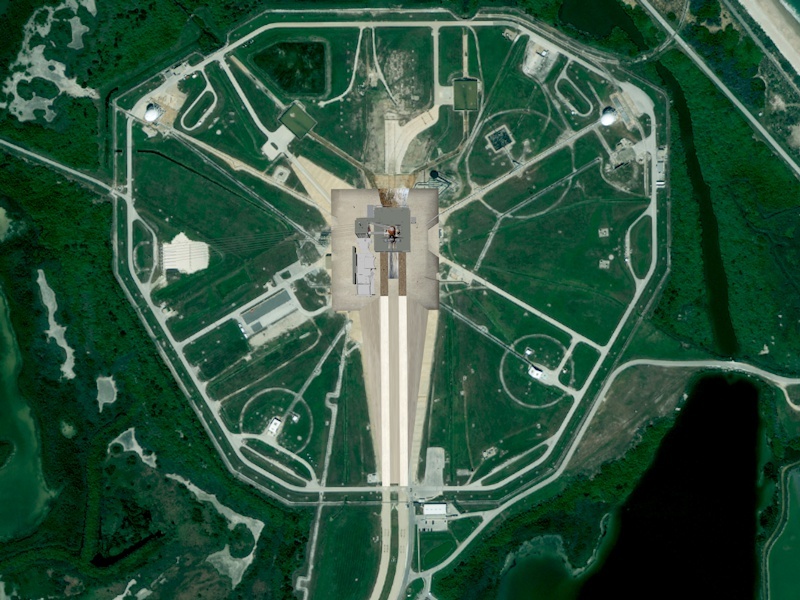 The following gallery shows the development of the launch complex in its early days, as well as stills from the nearly seventy strategically placed cameras. 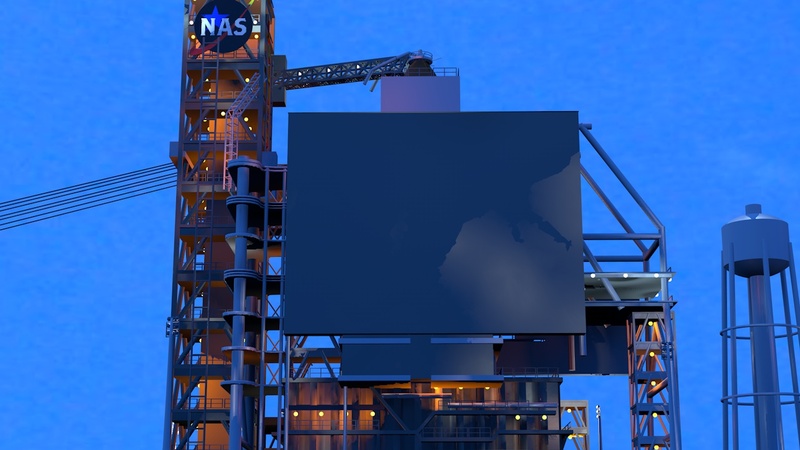 Light is generated from the sky using high-resolution images found in the internet, as well as from floodlights around the pad and an artificial sun. 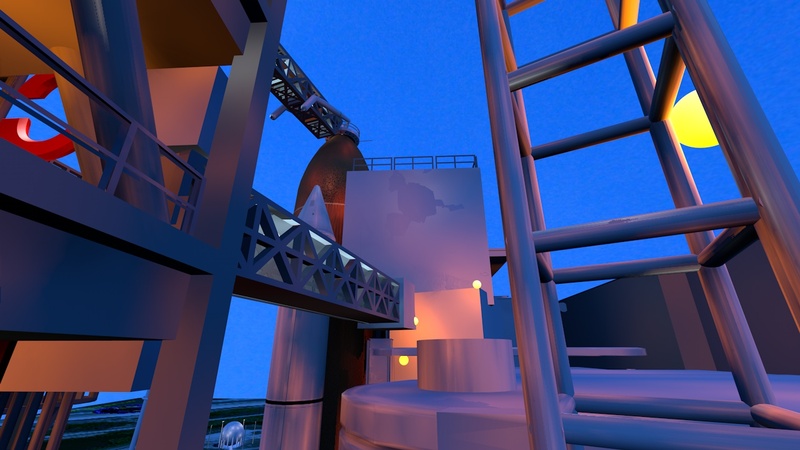 This was done through C4D’s global-illumination feature. OTV-10: Camera Site 3 — One unused camera angle exists. OTV-11: Camera Site 2 — One unused camera angle exists. OTV-15: FSS 235-foot level — One unused camera angle exists. OTV-21: flame trench southeast — One unused camera angle exists. OTV-25: MLP roof northwest — One unused camera angle exists. OTV-42: Orbiter Access Arm — Footage from real Shuttle launches is used for this camera. OTV-43: FSS 255-foot level — One unused camera angle exists. 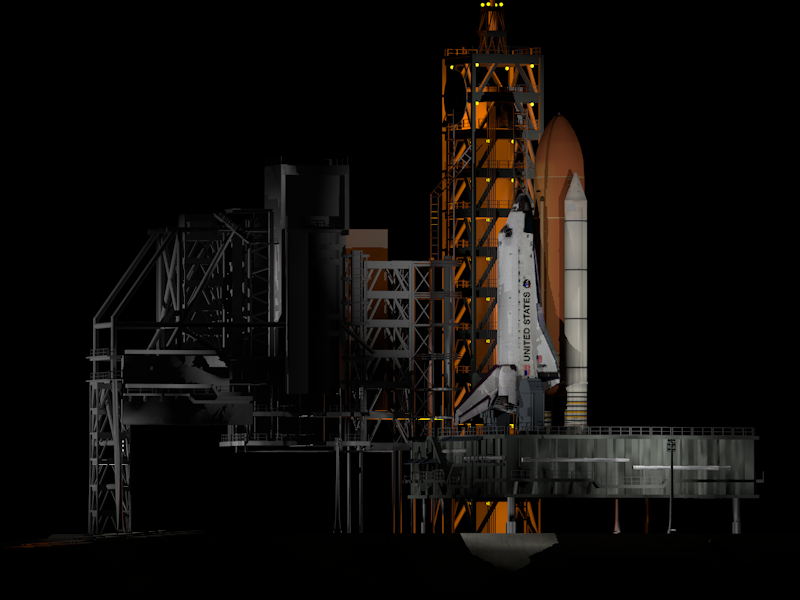 UCS-15 (Pad A), DLTR-3 (Pad B) and the fictional SCTR (Pad C). 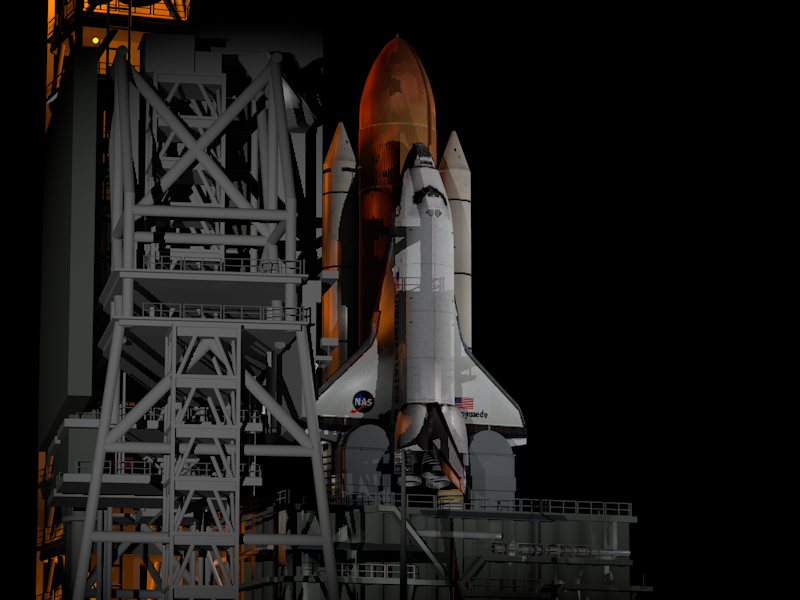 The model belongs to NASA’s collection of space-related models. The models are free for creative and demonstrative use. 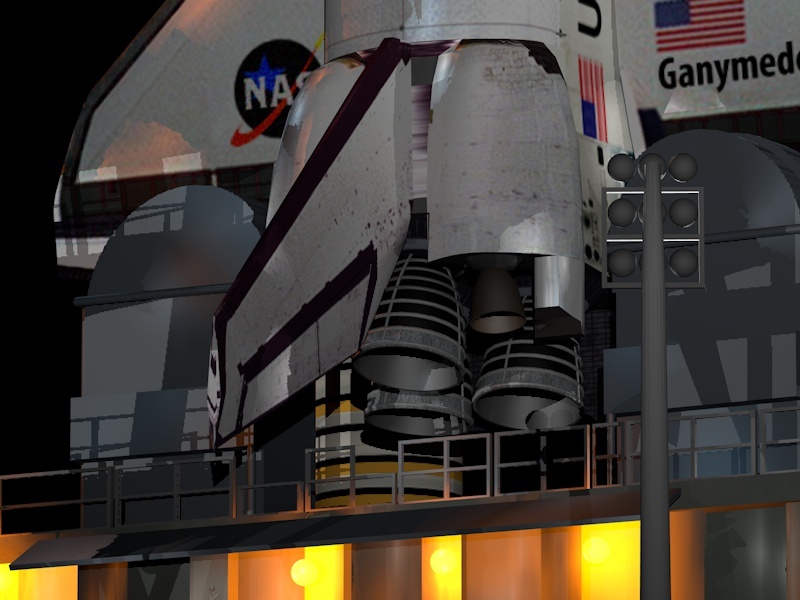 The package contains highly detailed textures and bump maps, but being a devout follower of the Shuttle program, I decided to do a little extra work–a lot, rather. 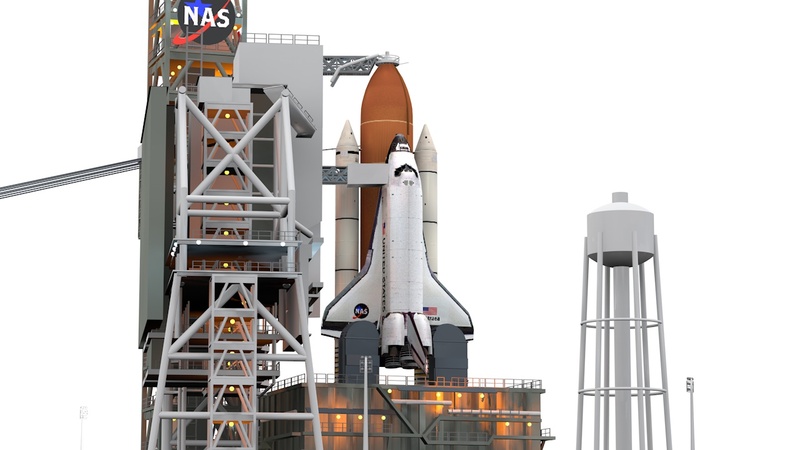 I wanted to continue on with my fictional NAS, so I swapped out the NASA markings with my own through Photoshop. 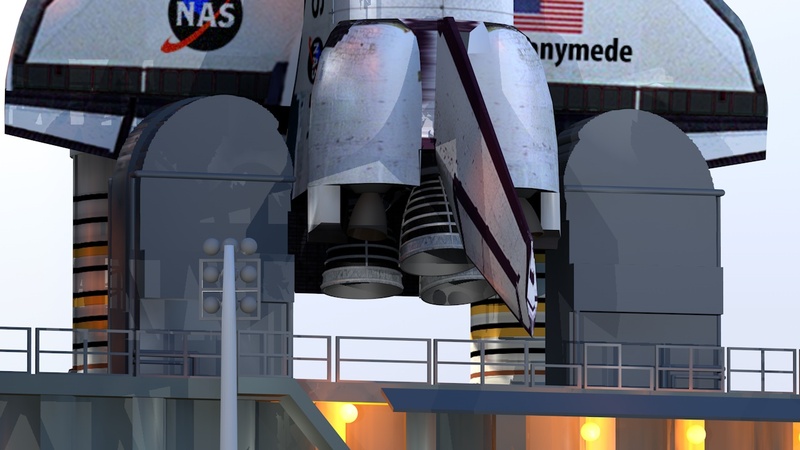 Other details, such as sandings, tan lines and color changes on the foam of the external tank (ET) were also taken into account, as well as the coloring of the insulation on the Shuttles’ main engines (SSME). 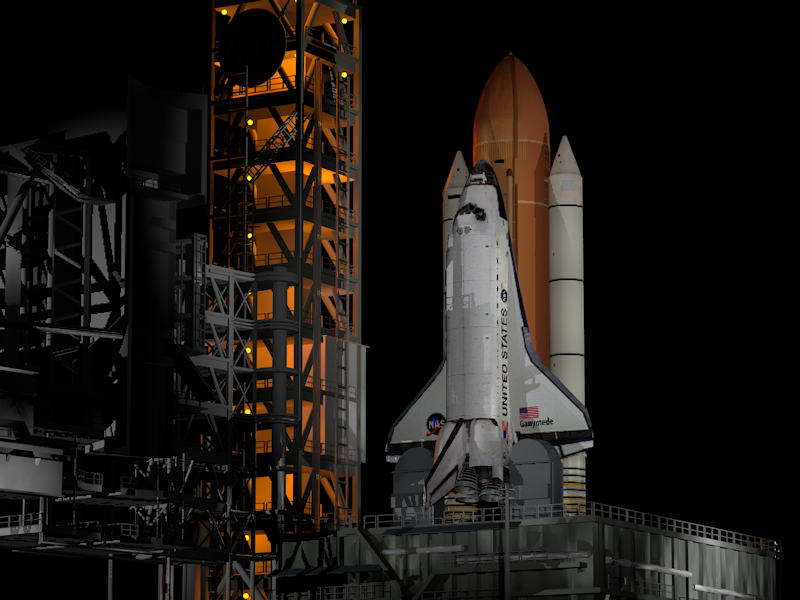 I was originally going to color the launch tower in accordance to my original paper and wood model, but it looked hideous and I decided to leave it alone. 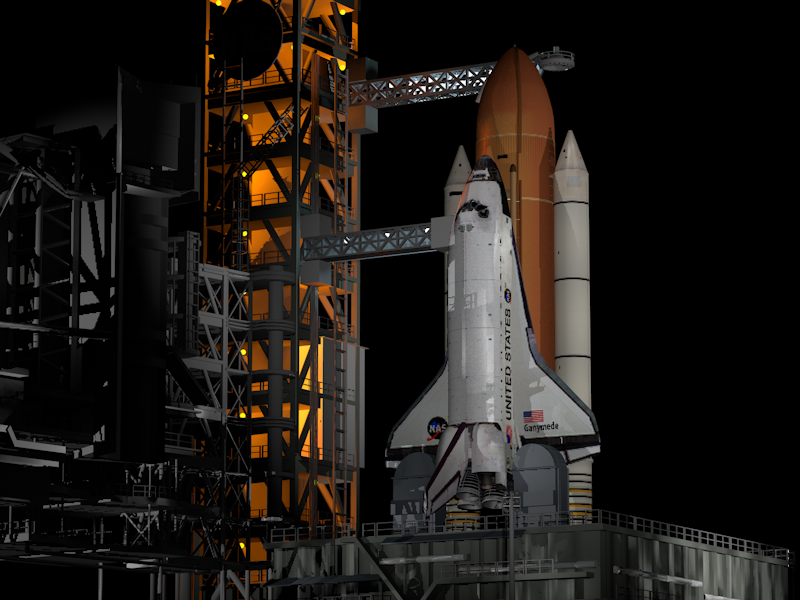 The assembly process was difficult as the ET is slightly off proportion and the launch pad is scaled way too small for the Shuttle stack. 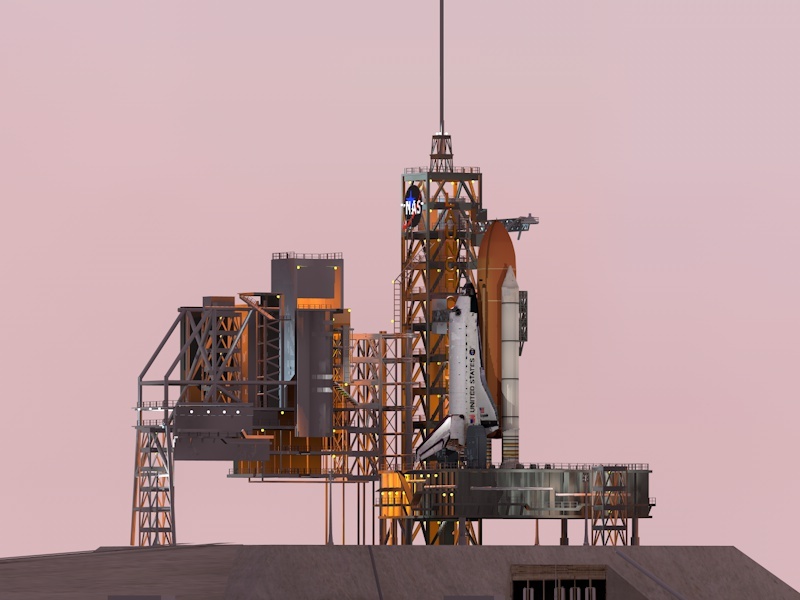 The mobile launch platform (MLP) was also too big for the rest of the launch pad, so I scaled everything, especially the orbiter, and extended the Rotating Service Structure of the tower to fit the Shuttle properly…or so I thought. 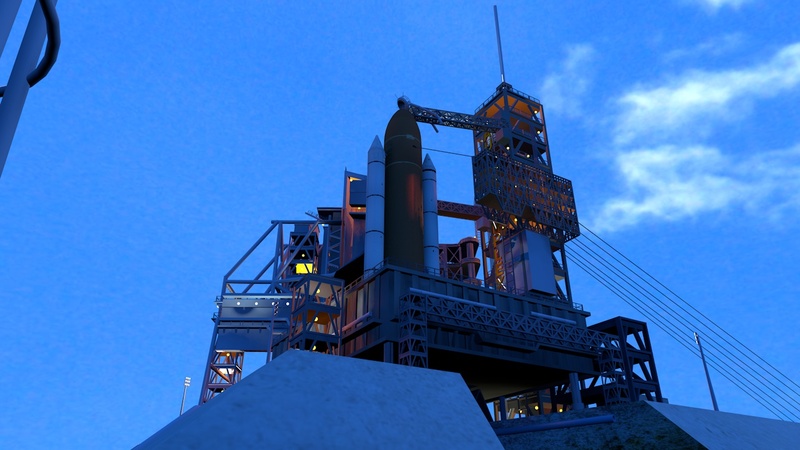 Nearly finished around Christmas 2012, I looked at the launch replays I created and noticed that the orbiter was way too big for the stack. With this becoming a blaring mistake, I essentially had to start over from scratch. 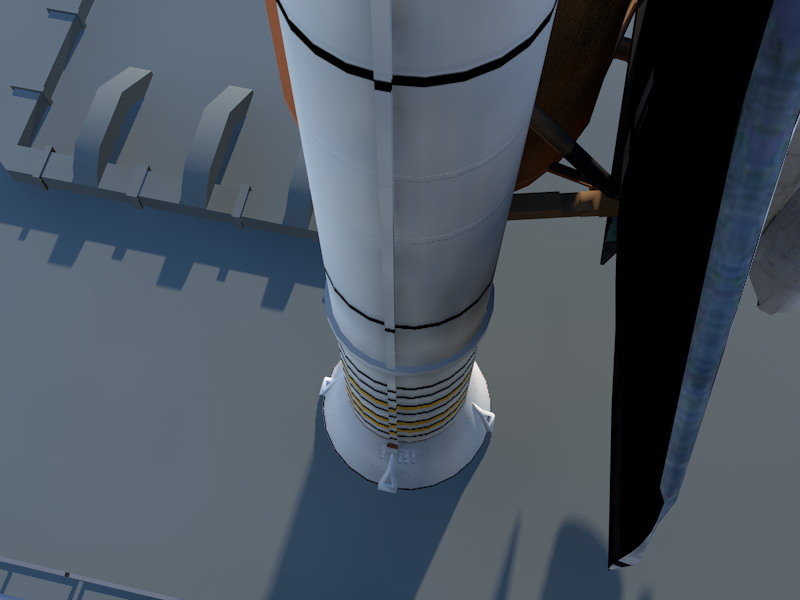 Ironically, the orbiter was the correct size to match the launch tower, but the SRBs and ET were not. I had to re-scale them and with doing so, I had to re-scale the MLP as well. 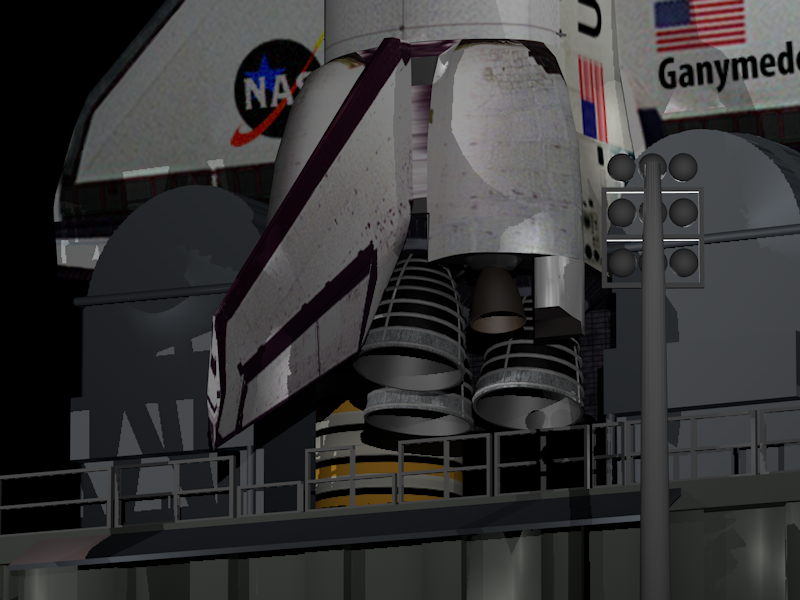 Along with other adjustments, both necessary and unnecessary, I decided to place my cameras more accurately to real-life while adding models of the pads’ Operational Television cameras (OTVs) as placeholders, thus giving the launch pad even more depth. I made all of these changes over the course of a week. 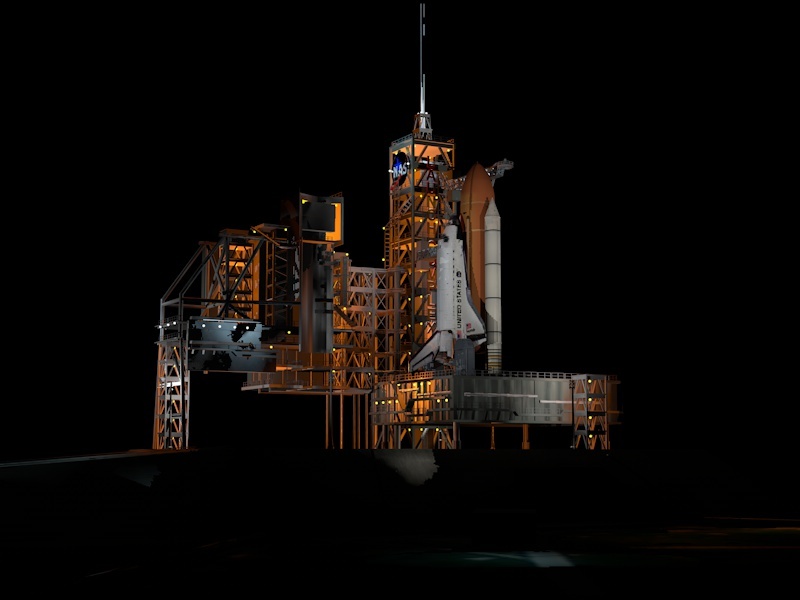 This was the launch pad and Shuttle in the original set-up. This is the launch pad after modification. Note the change in proportion. 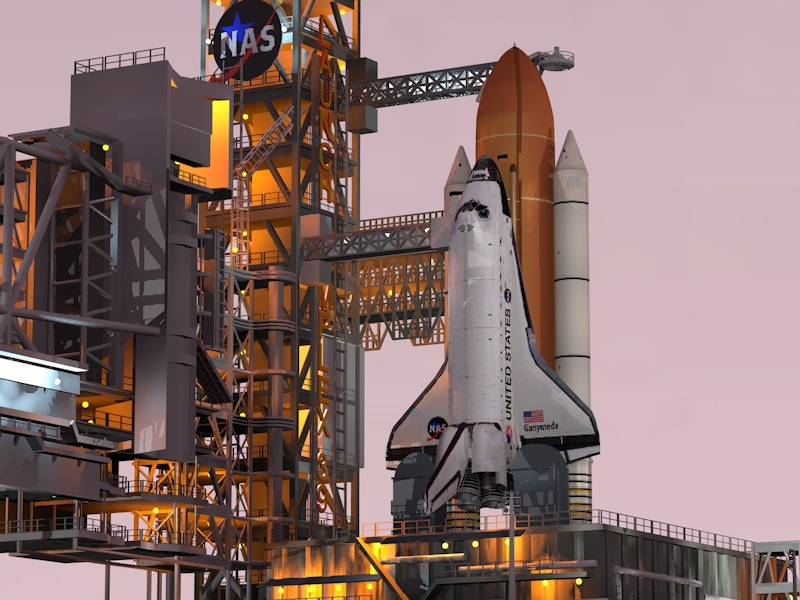 The entire launch countdown, as well as the camera replays, are modeled after the real NASA broadcasts and were examined with a fine-tooth comb. Sounds of the engines and boosters are recordings of engine tests and on-site launch videos that I converted from mono to stereo audio. 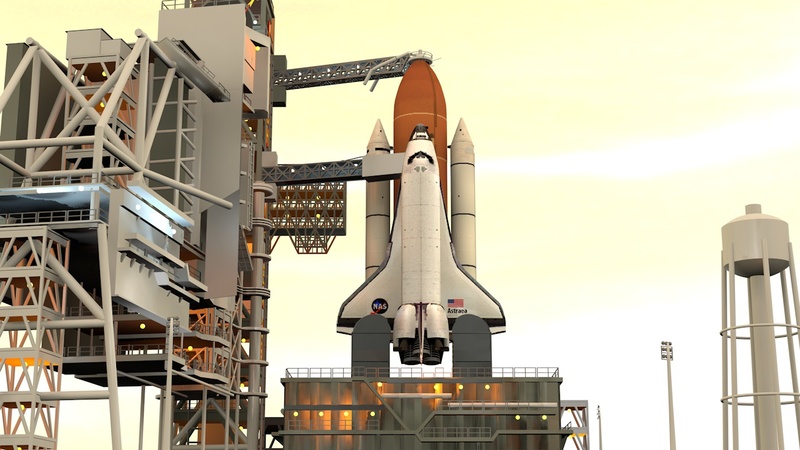 Additional sounds, such as the venting and the radio calls, were extracted from past Shuttle launch coverage. 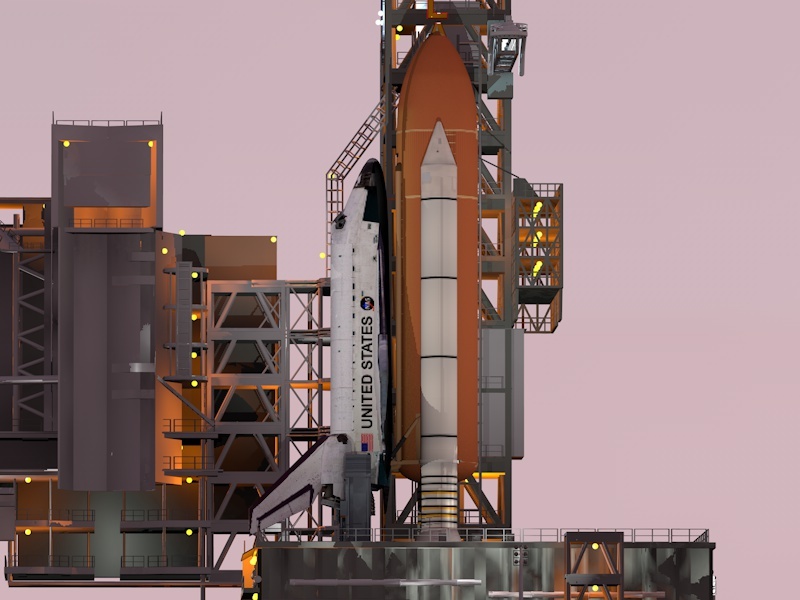 There are several 3D Shuttle launch simulations uploaded to the internet, but staying true to my ethic and enthusiasm, I made sure that mine looked as close to the real thing as I could possibly get. 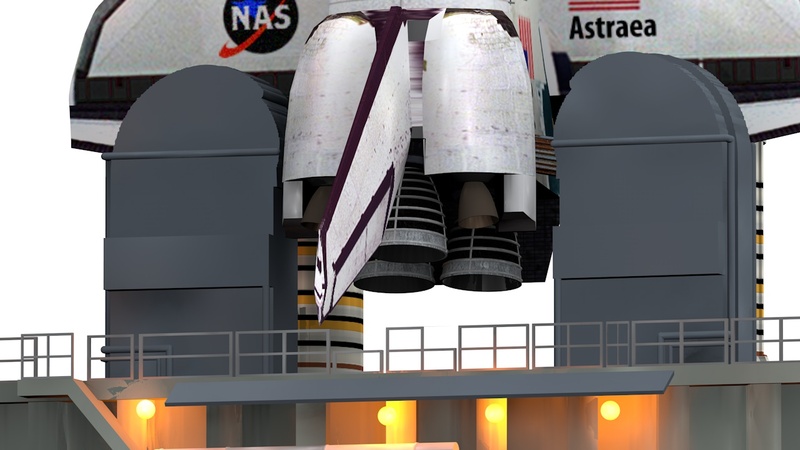 With that said, the detail that I gave to the ignition sequence has caught the attention of many, asking how I managed to pull it off. Are they overlays? Are they CGI? Well, let’s spell it out milestone by milestone. This is when the countdown resumes from the T-9 minute hold. All of the effects used during these moments are video overlays of steam and smoke which were blended, masked, positioned and rotated with respect to camera angles, the time of day or even wind direction, which usually comes from the north or the east due to the ocean. Starting with SM-9, these were replaced with my own custom overlays. Additional plugins for rippling and motion blur were also used for some of the long-distance tracking cameras to represent a heat haze on a hot day. Overlays of steam are placed behind a mask of the handrails, compared to real footage on the left. Images cropped from STS-102 and SM-3. Flowing ripples and a gaussian blur were used to create a heat haze, compared to real footage on the left. 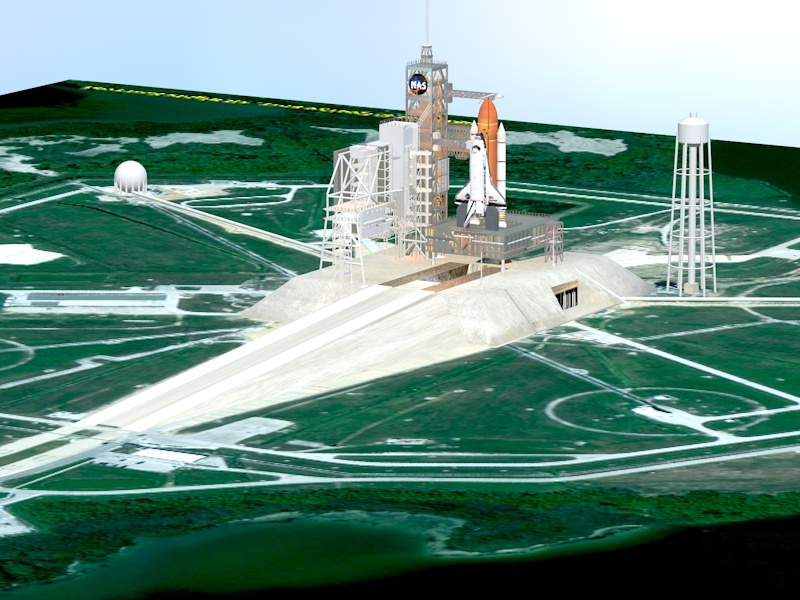 Images cropped from STS-121 and SM-4. At T-15 seconds, the Sound Suppression Water System cuts on. This is a system of pipes on the launch tower, pad and platform that pump out thousands of gallons of water from the adjacent water tower onto the launch pad itself. This helps reduce the noise and vibration from the SSMEs, whose shock would otherwise damage the vehicle. This was also mimicked through the use of steam overlays, but I used a self-made waterfall effect for the torrent that emits from the launch platform. This was done in order to make my close-up shots more realistic. 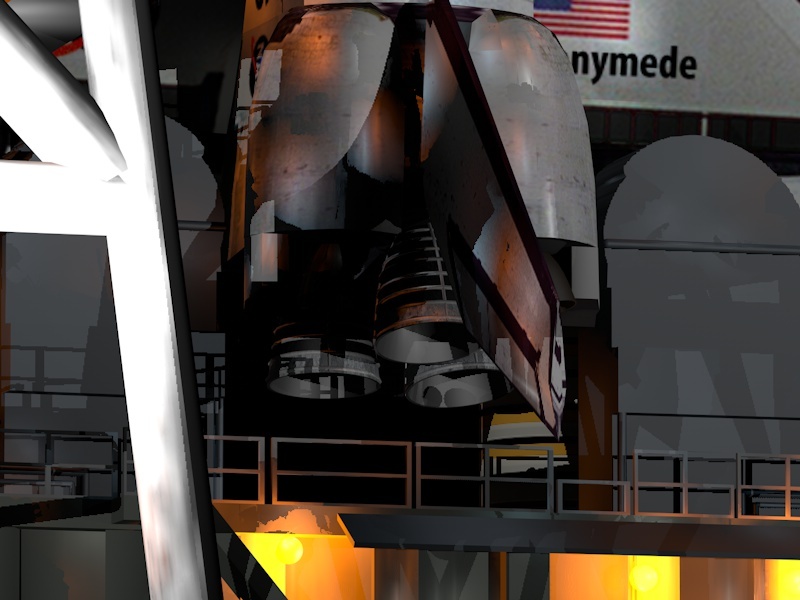 Still a work in progress, waterfall compositions were placed and masked beneath the launch platform’s SRB and SSME holes, compared to real footage on the left. 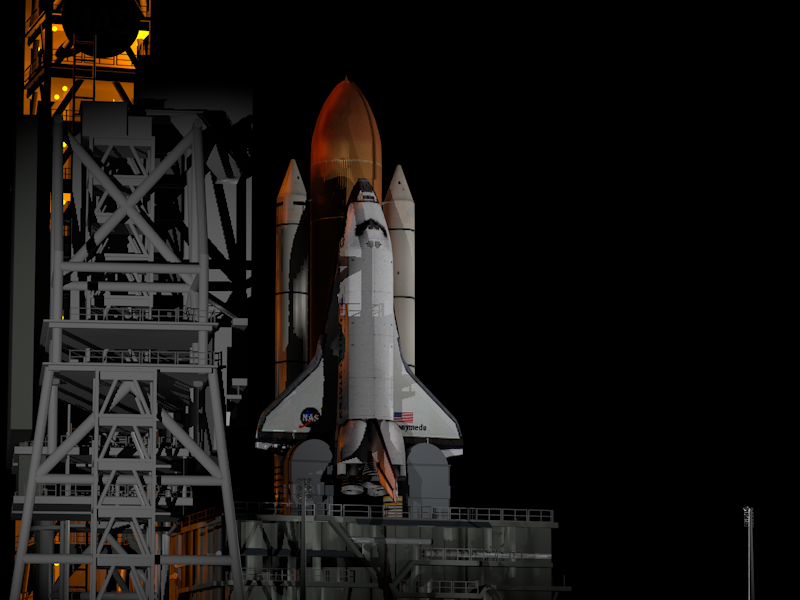 Images cropped from STS-122 and SM-4. Smoke overlays were used to create a mist, compared to real footage on the left. 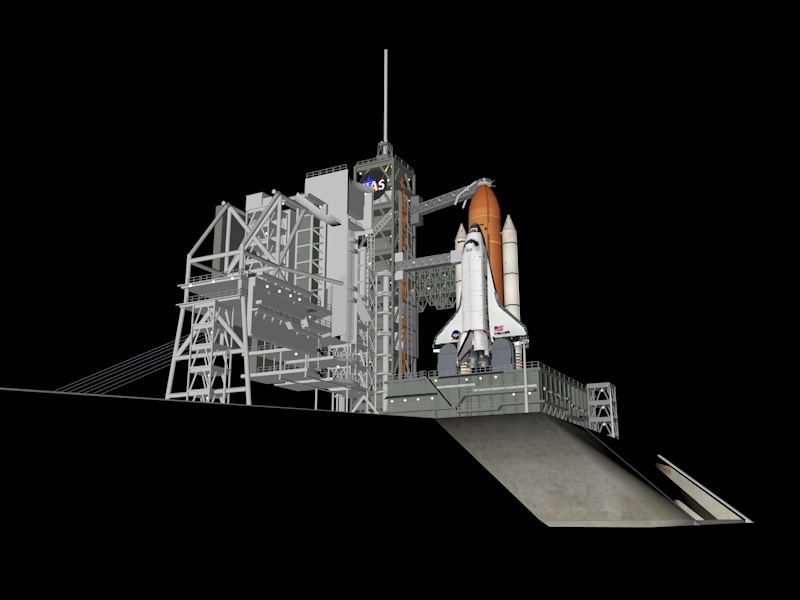 Images cropped from STS-130 and SM-3. At T-10 seconds, the Hydrogen Burn-off Igniters fire. This is a system of six sparklers whose fireballs burn off any excess hydrogen gases that would cause an explosion once the SSMEs ignite. These were created through the use of particles with a glow effect, and I created different overlays for front, side and angle views. The blend modes for these are changed based on the time of day for the launch as light naturally appears brighter in a dark environment. 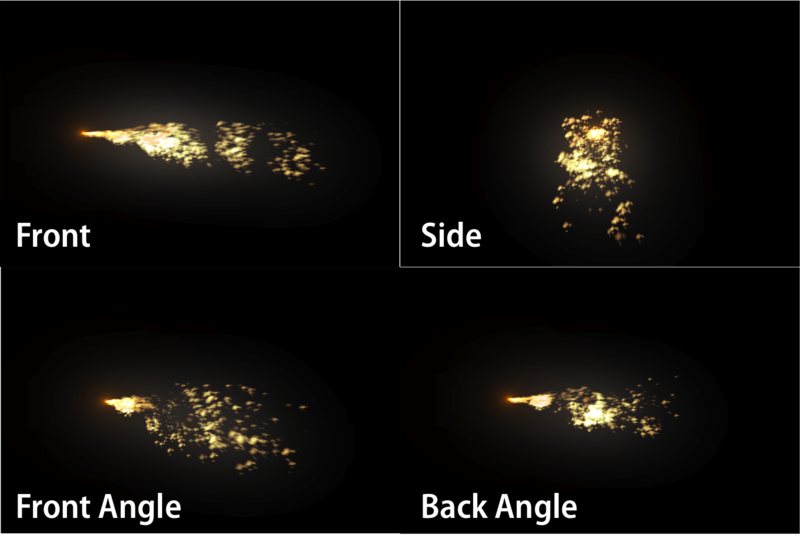 The igniters in action, compared to real footage on the left. Six are used–three on the left and three on the right, with two of them in the front and four in the back. Initially, I opted to only use four in total. The final two have since been added. Images cropped from STS-124 and SM-3. Stills of my overlays, these are different angles that I use depending on the host camera shot. Featured are the front view, side view, a view pointing toward you and a view pointing away from you. A day launch, SM-2, with a “lighten” overlay blend mode, versus a sunset or night launch, SM-3, with an “add” blend mode. At T-6.5 seconds, the engines cut on within .12 seconds/3 frames of each other, starting with your right, then the left, then the center. The SSMEs are so powerful that they can drain an Olympic-sized swimming pool in a mere twenty-five seconds, but they are also they cleanest ever designed as they are essentially fueled by water. 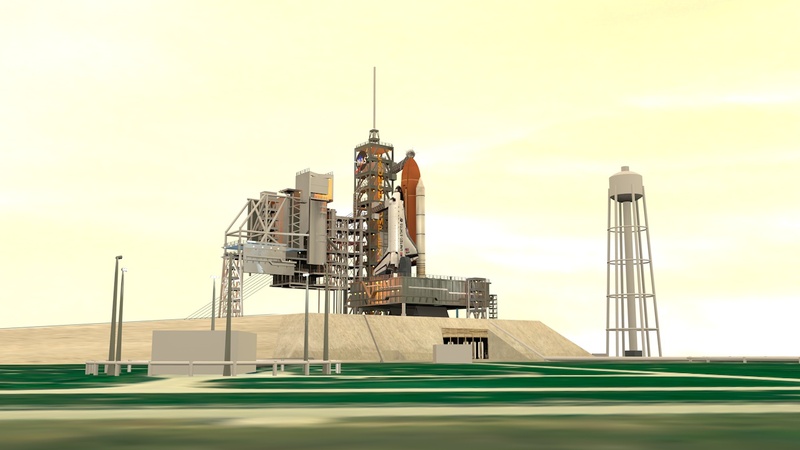 The massive orange-hued ET feeds them during their eight-minute burn, and it stores one part of liquid oxygen fuel (LO2 or LOX) for every two parts of liquid hydrogen (LH2)–water. 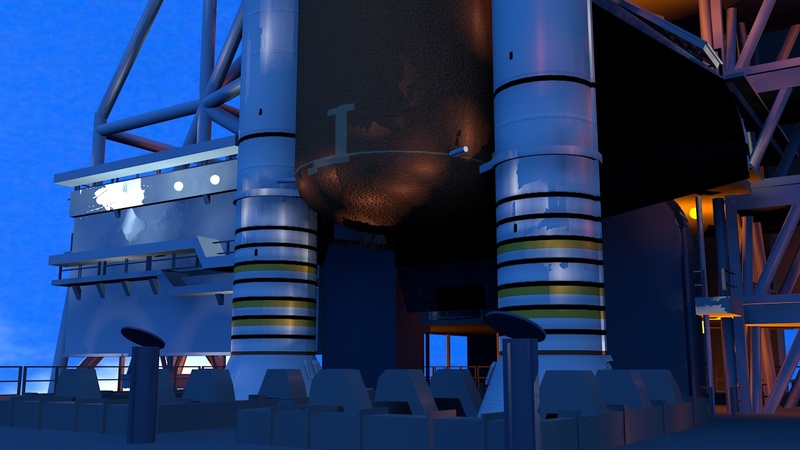 Because of the way the fuel is fed through the engine chambers, the LO2 burns first, causing a disorganized red flame. From here, the LH2 kicks in which turns the flame almost clear. This exhaust was created with a white oval–just that simple. With overlays of a steam puff and a flamethrower used represent the actual ignition, I applied a downward light ray effect and added some heavy noise to mimic pulsating rocket exhaust. As of SM-6, the flamethrower overlay was replaced by an SSME test fire. I also keyframed the color to change from red to white at specific points. During the ignition of probably all supersonic engines, bright white mach diamonds appear and the exhaust itself takes the shape of a helix whose points intersect at the diamonds. This was created by duplicating the dot and shifting it downward where needed. The mach diamonds were created using a lens flare. There is also one very distinct detail that I’ve yet to describe, and that’s the shockwave. My favorite effect, this is a quick, pulsating reflection of light that resembles lightning, and that was created using a basic lightning plugin. 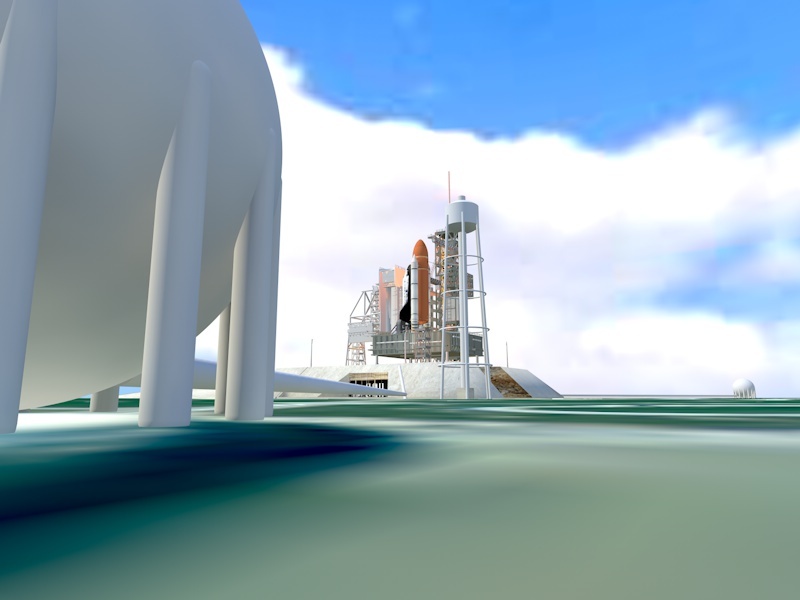 As soon as the 6,000+ degree Fahrenheit exhaust meets the suppressant water beneath the launch platform, a large cloud of pure white steam rapidly builds. This was, without a doubt, the hardest element to recreate. I’ve tried cheats and overlays galore and nothing would work. Then I came across a tutorial for a simple smoke trail, took my preexisting knowledge of particles and created some really nice-looking smoke and steam. This is also doctored in various ways to represent wind and daylight. 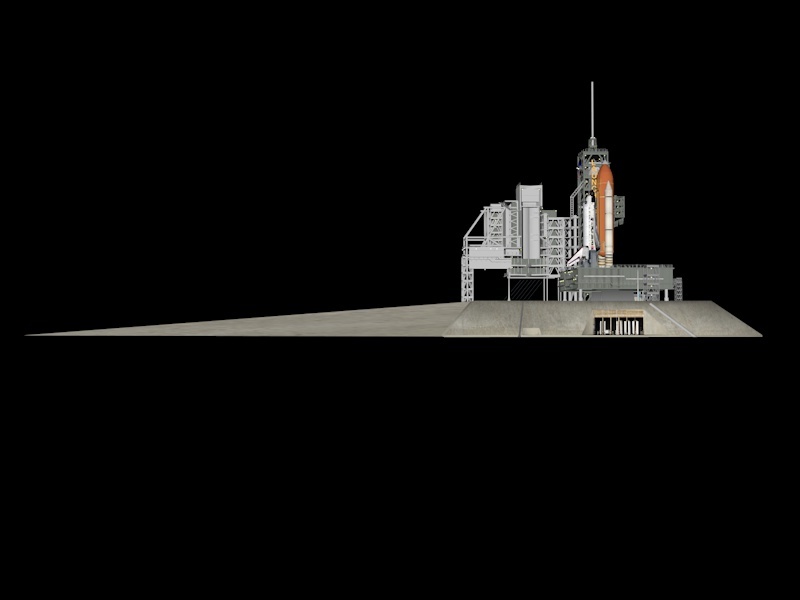 At T-0, the bolts that keep the Shuttle grounded explode (explosion overlays), the SRBs ignite and we’re on our way. The solid fuel flame plume has garnered the most attention as no other upload on YouTube has anything remotely similar. The original plan was to use a smoke overlay and color it as needed, but all it took was a flamethrower/torch tutorial for After Effects to give me exactly what I needed. I added a lens flare at the top of the plume and my job was done. This was the element that was designed first, and I took that composition and made the necessary changes for the igniters. Eventually, this project called for more accuracy. For SM-8, I updated the particles to make the plume less rigid, and I also adjusted the spread so that I could assign a plume to each SRB, rather than both at once. 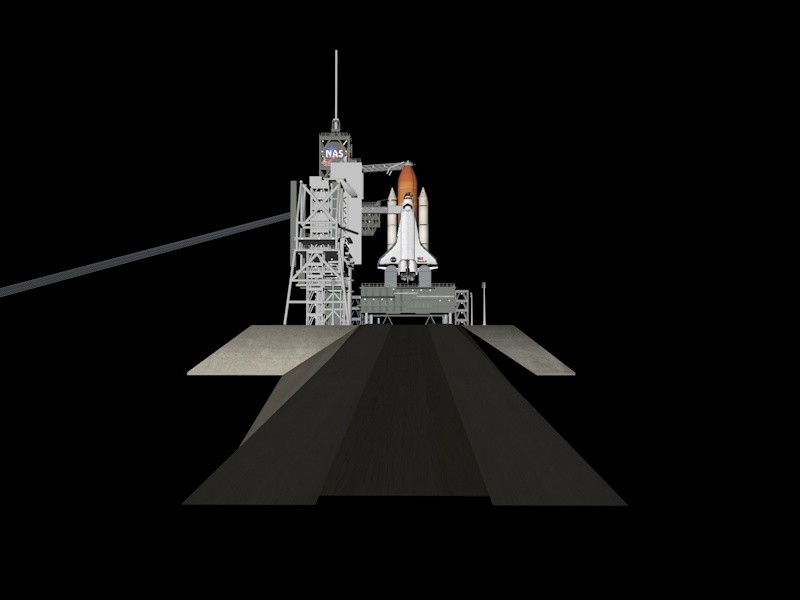 The final elements are the Orbital Maneuvering System (OMS — ohms) and Reaction Control System (RCS thruster) burns, and max-q, which is the aerodynamic shockwave that forms around the Shuttle right between liftoff and SRB separation. 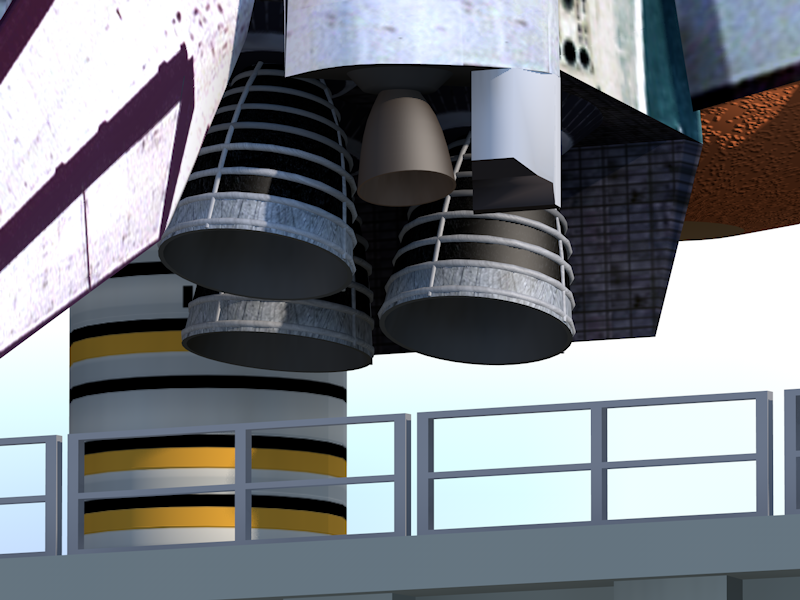 These are simply reworked versions of the SSME exhaust. 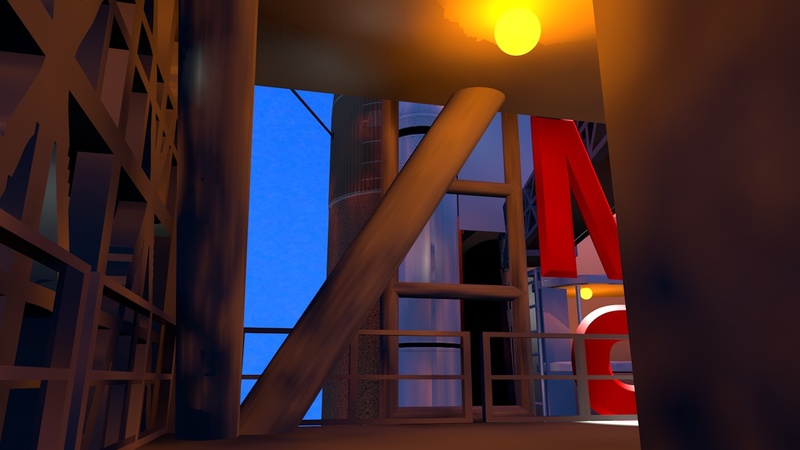 Starting with SM-8, max-q was updated, utilizing a noise overlay as opposed to the Shine light rays plugin. 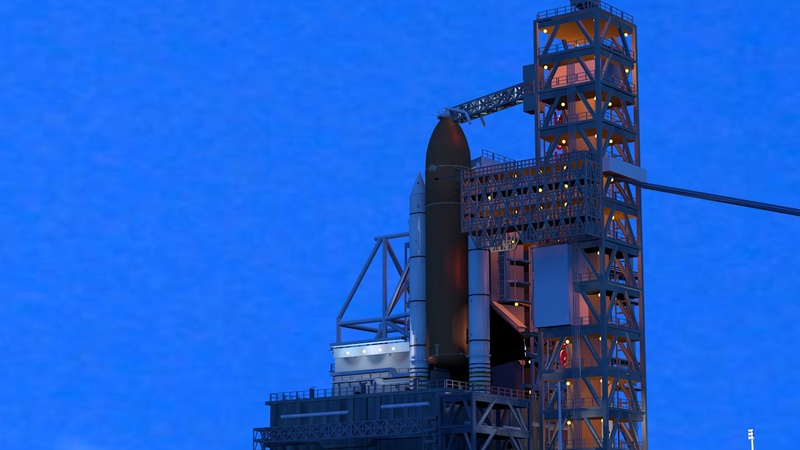 The Shuttle stack maneuvers in various ways for various reasons, starting at SSME ignition. Some of these are intentional and some are due to physics. 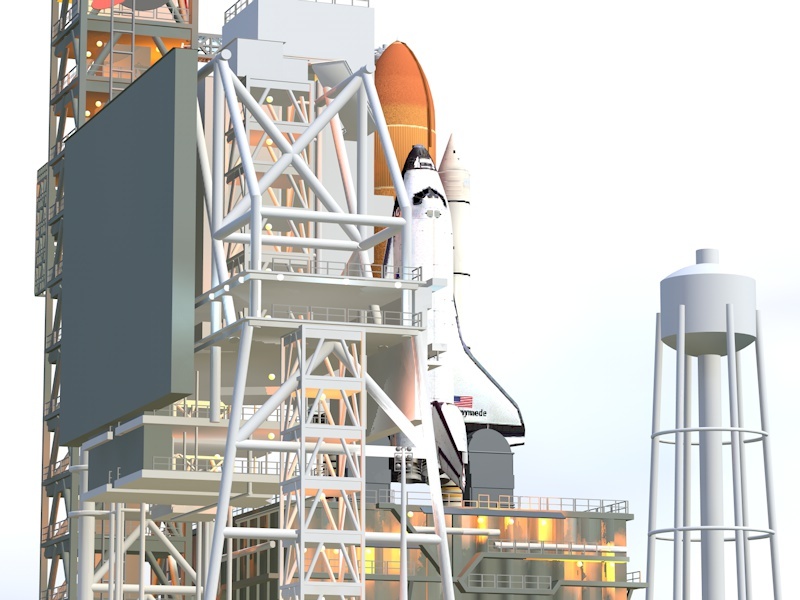 There are three powerful main engines on the assembly, none of which are in the vehicle’s center of gravity. 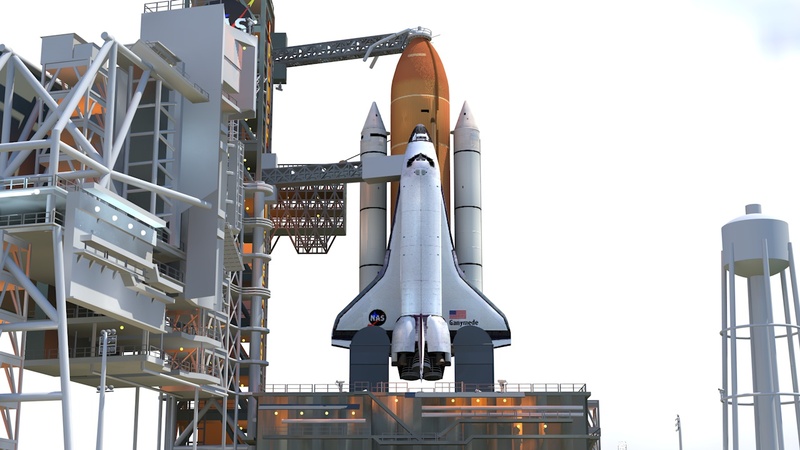 This causes the stack, which is bolted to the launch platform, to bend back nearly six feet, then regain momentum. 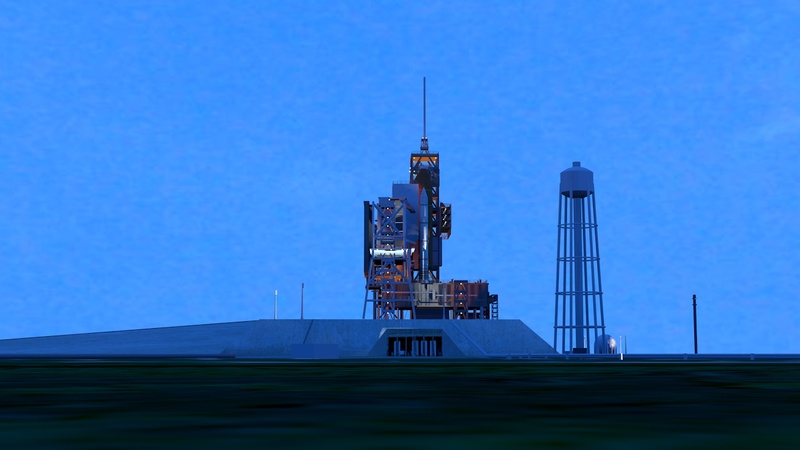 From here, the stack launches at the correct up-and-backward path towards the ocean at T-0. 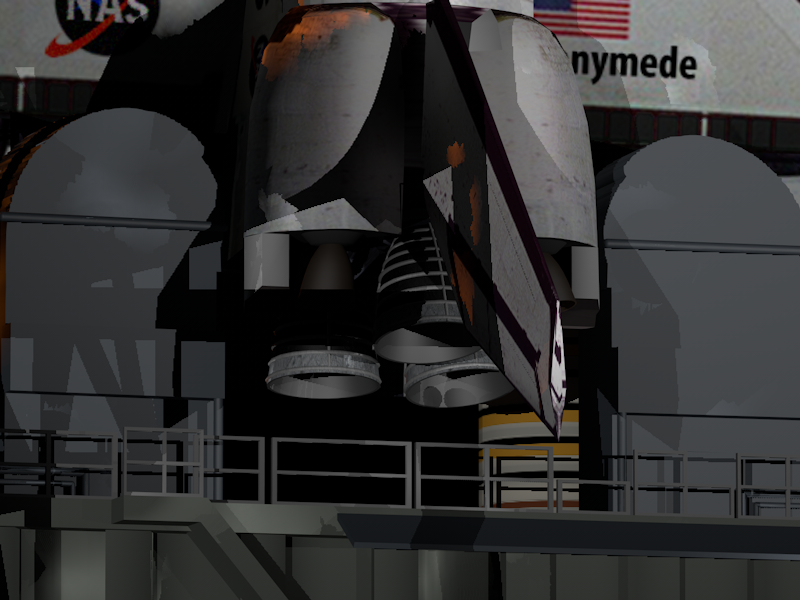 Because of this, the null to which the Shuttle’s pieces are aligned to is in line with the bottom of the boosters. After all, this area is the source of the power. About ten seconds into the flight, just after clearing the tower, the stack does a 90-, 120- or 140-degree roll-pitch-yaw down and to the right. 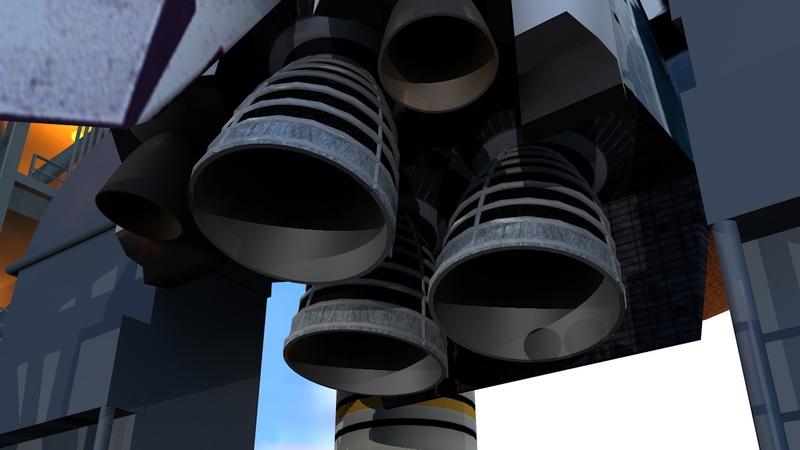 The amount of roll depends on the destination, and is done through a very slight gimballing or “swiveling” of the SSMEs and the SRBs exhaust nozzles, as well as movement from the orbiter’s elevon flaps on the wings. This relieves the weight on the delicate spaceplane, and also relieves stress from sunlight. The roll was created by carefully pivoting and banking the Shuttle stack, and having my tracking cameras gradually move and tilt to create the impression that the rocket is zooming past. Handheld camera movement was created using wiggle expressions in After Effects. After ten launches, I grew dissatisfied with the above camera trick; for SM-11, I created an all new sequence in which the shuttle actually leaves the ground. 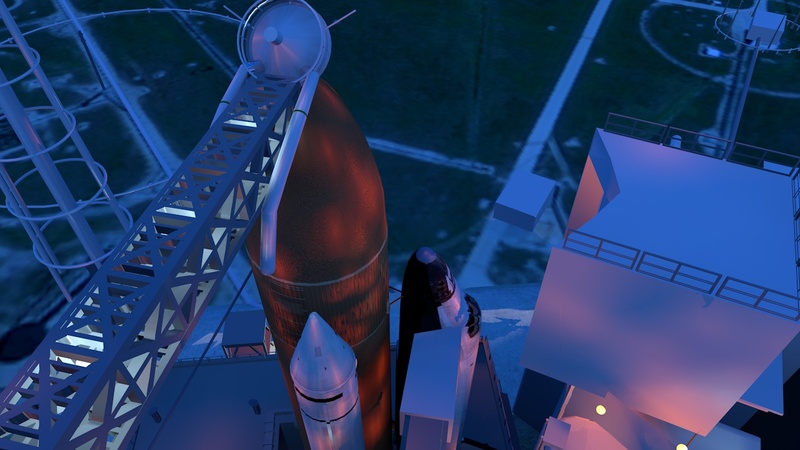 If you watch my launches, you’ll see the SRBs separate, the remainder of the stack perform the heads-up roll (performed so that the orbiter will now have better signal with the nearby Tracking and Data Relay Satellites, or TDRS–teedriss, for Mission Control), and then the external tank separates as the orbiter pitches upward and flies off. This was all done through camera tricks; the stack is sitting still, while everything around it is moving and a background video plays underneath it. Ganymede, flown every first mission. Castor, flown every second mission. Pollux, flown every third mission. Astraea, flown every fourth mission. Daedalus, serving as a relief orbiter. The orbiters, or “the Shuttles themselves,” are named after the figures in which the zodiac constellations Aquarius, Gemini and Virgo represent respectively. Having started with four, I alternate among them each mission while one orbiter would eventually sit out for “maintenance” every few missions. In real life, this downtime is called Orbiter Maintenance Down Period–OMDP or Major Modification for short. 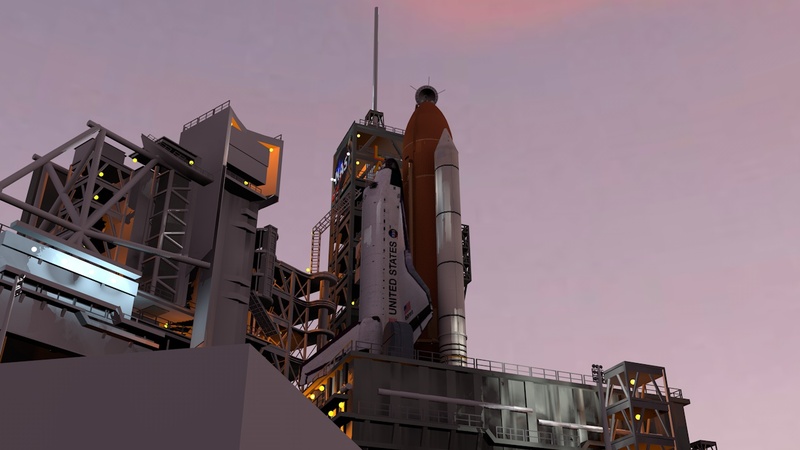 These launches have a fan in Zachary Sellingrr on YouTube, as he launches Shuttles on the highly popular Orbiter simulator. 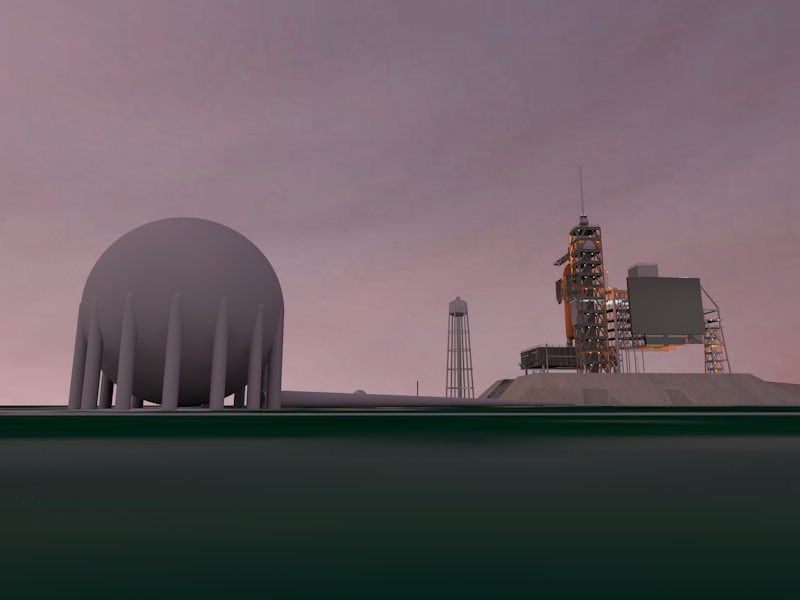 Around the tenth mission, he reminded me of an old thread I started on the Rocketry Forum in 2005–humble beginnings. 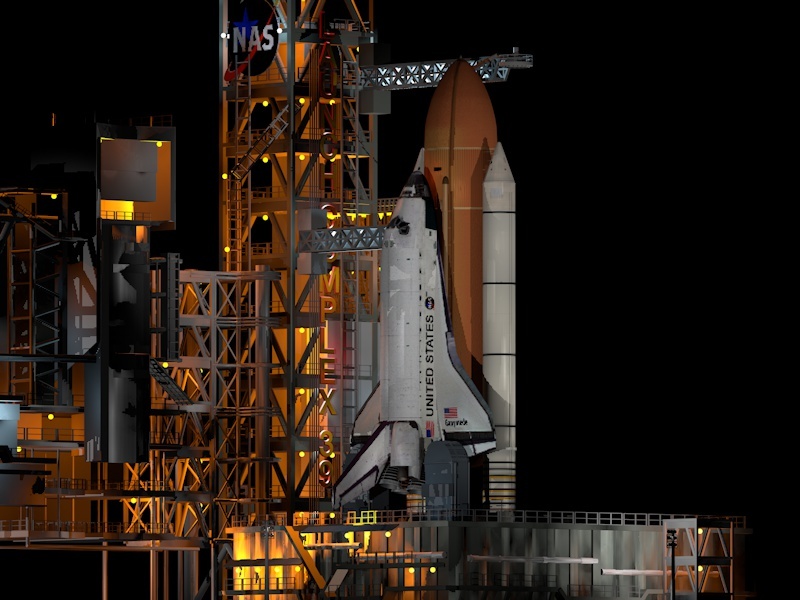 here’s the deal: i am building a complete scale model spaceshuttle. 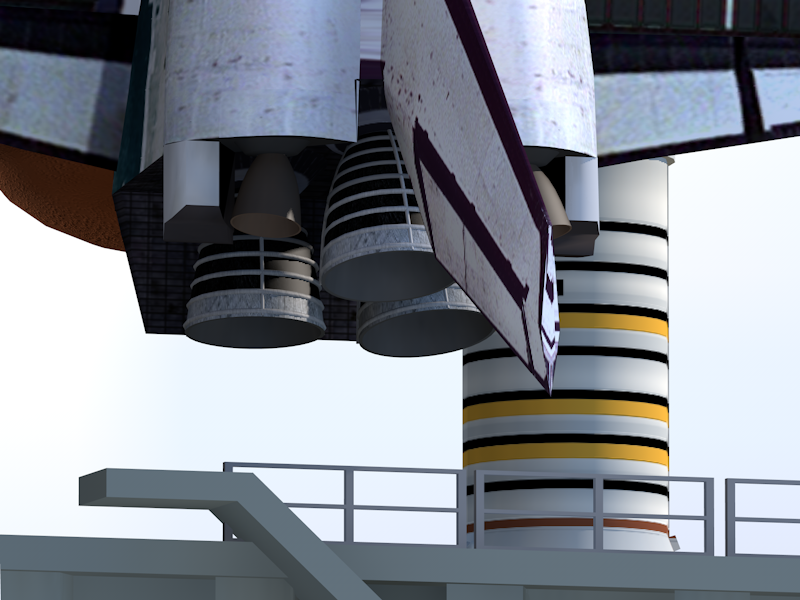 for the shuttle’s main engines, i plan to use those mini engines for the teeny-tiny rockets that estes makes, and i will use the size “d” or”e” engines for boosters. 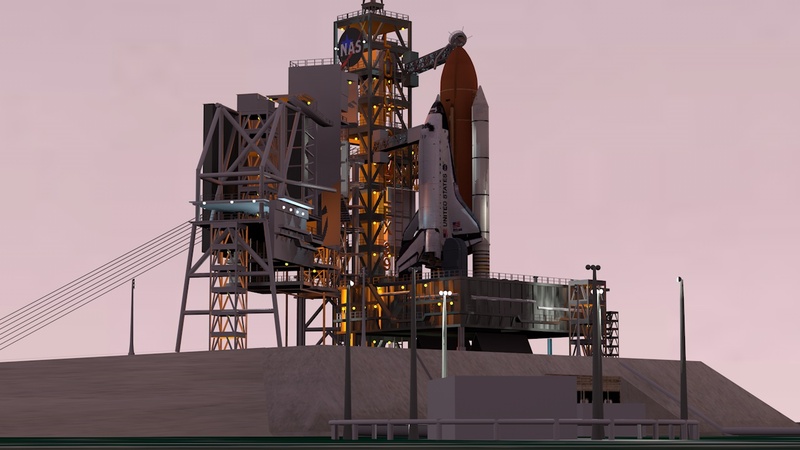 i plan to set it up like a real shuttle launch by having the tiny engines ignite a few seconds before the big engines, meaning that the shuttle won’t leave the pad until the big engines spark. is anything going to blow up or get engulfed in flames? Booster ignition and liftoff of Daedalus as she kick-starts a new era in the Space Shuttle program! My username was ‘spaceshuttle.’ Back then, I had ten orbiters with one, Daedalus, serving as a fill-in. Going back to my roots, I’ve revived that orbiter. Mission patches are a tradition in spaceflight, and they typically symbolize the objective of the mission. 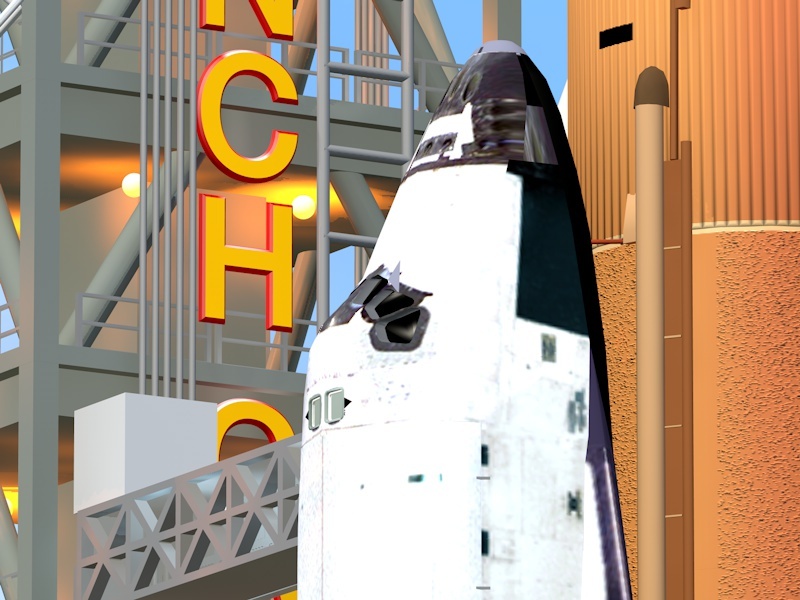 They will often feature the shooting star and orbit, the symbol of the Astronaut Office. Below is the NAS logo, as well as patches that I created on PowerPoint and Photoshop to go along with each launch. The crews of my missions are named after some of my favorite people including news anchors, cast members, classmates and family. As a last-minute addition to this long-term project, the crew photos help make this whole project seem complete. In real life, the flight crews take a quick break during the beginning of training at the Johnson Space Center in Houston, Texas to snap a few photos for their upcoming mission. One official photo and a few creative ones are released to the public. 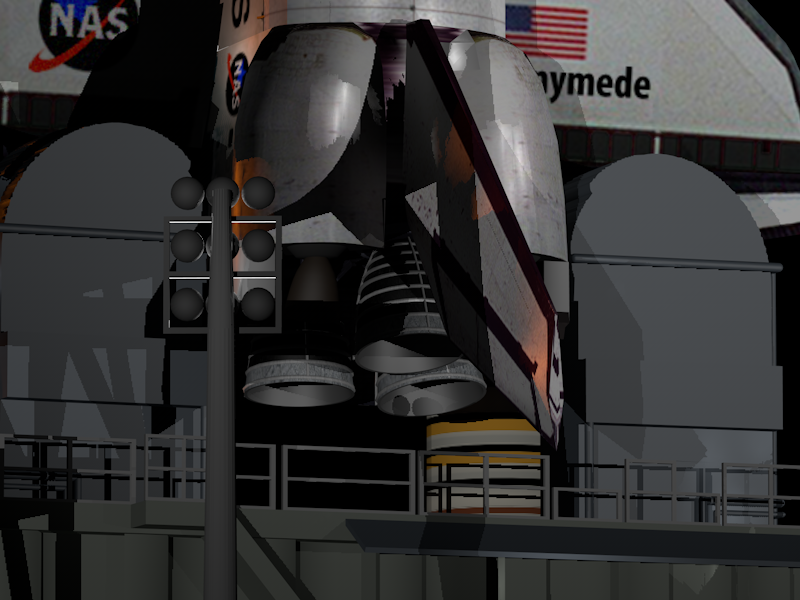 I created my own using re-worked astronaut models from the NASA site mentioned above, customizing and rigging them as best as I possibly could. For those who don’t know, rigging is the process of making a skeleton that allows the limbs and other parts of your 3D characters to move. Pingback: Javan Does Baton Rouge — TJ Ribs | Javan H.
Pingback: Dream Log: 12-26-13 — Follow-Up | Javan H.
Pingback: Dream Log: 12-26-13 | Javan H.
Pingback: “The Bold and the Beautiful” — Steffy’s Back (And Her Minions, Too) | Javan H.
Pingback: ‘GRAVITY’ — All in The Day’s Work | Javan H.
Pingback: I LOVE Affirmative Action Cookies! They’re My Favorite! | Javan H.
Pingback: “The Bold and the Beautiful” — You’re a Joke (I Know) | Javan H.
Pingback: Javan Does Baton Rouge — Highland Road Park Observatory/International Astronomy Day | Javan H.
Pingback: “The Bold and the Beautiful” — bqhatevwr « Javan H.